Sorry for the lack of pictures. This pattern is over a year old already, and I apparently deleted everything. :-/ I had to go on Facebook to find pictures of more than just the front view. R27- (sc in 1sc, inv dec) around (16) Finish stuffing. R29- inv dec 4x (4) Cut, weave ends and pull tight. Repeat as for body through Row 8. R10-12- sc Finish off, leaving a long end for sewing. Cone Feathers: Cut about 6 or 7- 4” pieces of yarn. Attach them to the top of the cone and trim them down to look like “tufts”. Stuff lightly- finish stuffing once you have the majority of the cone sewn to the top of the head. Make sure your tufts are facing forward, and angle it as you see it in the picture. Whipstitch it to the head. R6- (sc in 3, hdc, 3dc in 2, hdc, sc in 3) 2x- leave the remaining stitches unworked and finish off. Leave a long end for sewing. Sew to the face with the last two sections at the top (one for each eye). Beak: Repeat as for Head Cone through R9. Cut. Sew to face, stuff before closing off. Eyes: Embroider eyes on with gold yarn in small straight stitches. Wings: Holding a strand of red and a strand of thinner black at the same time. R6- (LEFT WING) sc in 3, 2hdc in next, (dc in 1, 2dc in next) 4x, 2hdc in next, sc in 8, (ch4, sl st in 2nd ch and next 2 chs) 3x, sc in the side of the last sc, hdc in next, sc in last 4. Join. R6- (RIGHT WING) sc in 3, 2hdc in next, (dc in 1, 2dc in next) 4x, 2hdc in next, sc in 8, hdc, sc in next, (ch4, sl st in 2nd and next 2 chs) 3x, sc in side of last sc, sc in 5sc. Join. Cut, leaving a long end and stitch to each side positioning the “feathers” to the middle of the backside. 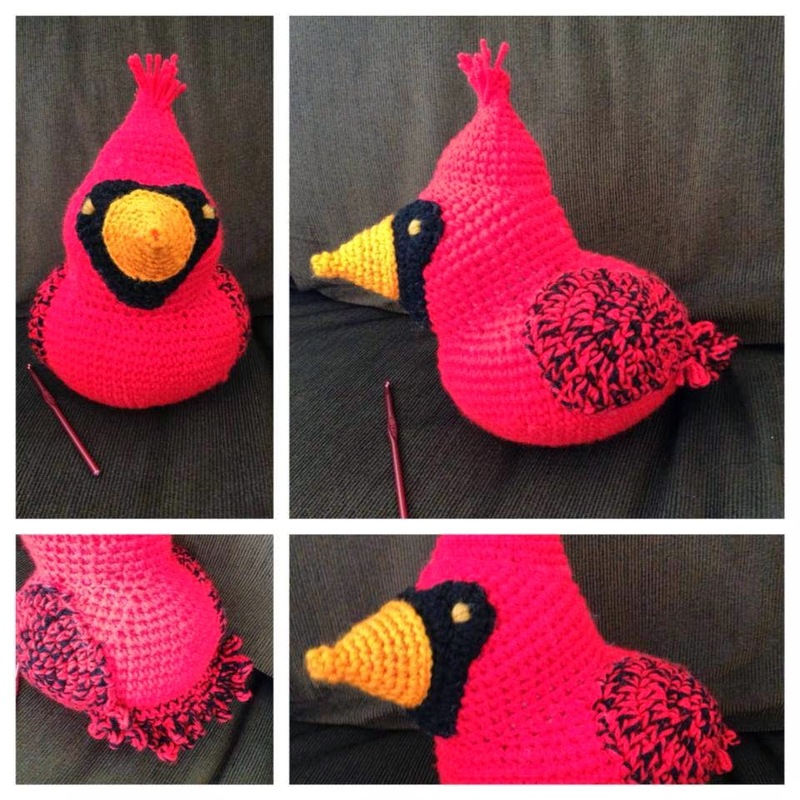 You will be crocheting the tail to the body in between the wing feathers. R2- ch1, turn, sk the 1st sc, sl st in next sc, (ch4, sl st in 2nd ch and next 2 chs, sl st in next sc on R1, ch6, sl st in 2nd ch and next 4 chs, sl st in next ch) Repeat that series of stitches across R1. Sl st to finish and Cut. Weave ends. All Done!